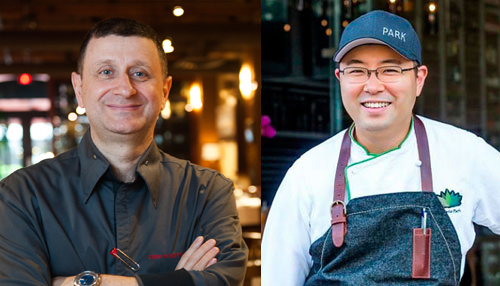 Antonio Park’s tutelage as a world-renowned chef started in his mother’s South Korean kitchen, in Argentina/Paraguay. Thanks to a fresh garden that spanned acres, and his mom’s insistence on creating everything from scratch, the drive for perfection, sustainability, and farm-to-table cooking became his raison d’être. This mantra carried him through years of training under Japan’s most revered cooking masters, fed his ambition to work his way up from a dishwashing station to running two of the most noted restaurants in Montreal, and moonlighting as a judge on one of Food Network Canada’s top-rated programs–‘Chopped’. 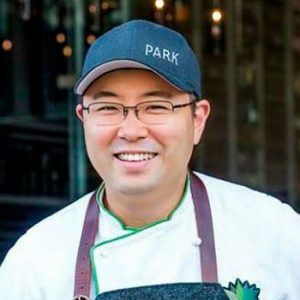 In 2012, Park launched Restaurant PARK in the heart of Montreal, where he aimed to present the purity of Japanese sushi emboldened with the South Korean and South American flavours of his heritage. His insistence on cooking with organic and sustainable produce saw Park procure private seafood and Wagyu/Kobe beef import licences (rarities in Montreal). This respect for the produce and animals, along with his creativity, vaulted PARK to critical acclaim, as the restaurant was recently named one of Canada’s top 100 restaurants also top 50 best Canadian restaurants and was also chosen as a global selection by Diner’s Club World’s 50 Best Academy. In 2014, Chef Park opened Lavanderia as an homage to his Argentinian roots, blending his obsession for fresh produce with the rich and sumptuous flavours of charcoal grilling. The restaurant has its own rooftop garden, offering clients the freshest produce possible during the capable months. Trout Lake is his most recent endeavour whereby he hopes to bring sustainable, fresh, savoury food outside of the traditional restaurant setting. Trout Lake will allow for new inspirations thanks to the clients,all while staying true to the authenticity that Chef strives on: fresh produce, simple ingredients, fine details.